Images of trauma: Corrie Tan on a didactic revival of Brecht’s classic, starring comedian Josie Lawrence. Mother Courage and Her Children, Southwark Playhouse. Photo: Scott Rylander. A year before Bertolt Brecht wrote Mother Courage and Her Children (1939), Virginia Woolf published Three Guineas (1938), her anti-war polemic written – like Brecht’s seminal play – as Fascism and Nazism marched across the European continent. Woolf’s essay circles around the impossible question: “How in your opinion are we to prevent war?” She makes the case against a culture of toxic masculine aggression and oppressive masculinity that revels in battle, one that glorifies the nobility of the soldier’s life and the spoils of war. Then she sketches out the possibility of a powerful feminine “influence” as a weapon against war, an influence that doesn’t draw from women’s sexual charm. Neither was Brecht, for that matter. His Mother Courage doesn’t employ her feminine influence against war; she thrives on conflict. Woolf may have spent three guineas to prevent war; Courage would have stolen them all to keep the war going. It’s difficult to like her, but it’s hard not to sympathise with her either – we are, after all, all selfish creatures. Over twelve years of the Thirty Years’ War in Europe from 1624 to 1636, Courage peddles and barters her wares in a creaky wagon, profiting off any side that will pay her. Protestant or Catholic, it’s all the same to her, as she swaps one flag and one loyalty for another as she weaves through occupied and devastated territories with her three children. I imagined her as a Wall Street old hand playing the stock market, shorting her stocks, relying on illegal tip-offs, and making the most of another’s misfortune. Given Brecht’s propensity for revealing the events of each scene with spoken or written summaries of the action, it isn’t too much of a spoiler to say Courage’s children are picked off one by one by the very war she is so desperate to profit from. Mother Courage and Her Children is a searing indictment of blind self-interest – and an acknowledgement that strength of character, goodness and virtue are also casualties of war, and those in possession of these traits rendered mute and powerless as the years rage on. Hannah Chissick’s production at Southwark Playhouse unfurls under the bones of a makeshift tarp in greys and browns. Before each half, a young boy plays with toy soldiers and a toy truck amid what feels like the chaos of an internally displaced persons camp, perhaps alluding to a lost innocence and the various contemporary refugee crises also unfolding around the world. Josie Lawrence is engaging as Courage, giving a generous, grounded performance as she coaxes and cajoles and attempts to bury her deeply-felt fear and anger at the blows wartime life deals her and her family. Most of the other characters’ strident monologues, however, all seem to be pitched at the same frequency, blending into a loud and indistinguishable hum. The exceptions are Laura Checkley, providing comic relief as the flamboyant, purring prostitute Yvette who, like Courage, skillfully navigates the sexual desires of the higher echelons of the military to her advantage, and Phoebe Vigor in a heartbreaking turn as Courage’s mute daughter Kattrin, the one character overflowing with empathy and righteousness, who is constantly ignored or silenced. The three-hour staging – longer than some wars – soon begins to flag in energy, and Lawrence is left to heave it behind her like Courage’s goods-laden wagon. The ensemble’s uneven performances as they struggle to speed through paragraphs of text aren’t enough to sustain the epic from start to finish, even with the jaunty live musical interludes (that occasionally, and unfortunately, drown out the voices of those singing). There’s a timely relevance to Brecht’s text in an era when we are saturated by images of trauma, desensitised to the strife tearing apart countries and territories around the globe, and rendered inert as opposed to making a difference. But this urgency doesn’t hold here. This production captures the drudgery of a long-drawn war, and the callousness of human selfishness, but the sharp, well-aimed criticism of Courage’s – and our – compromised morals that Brecht intended never really hits home. 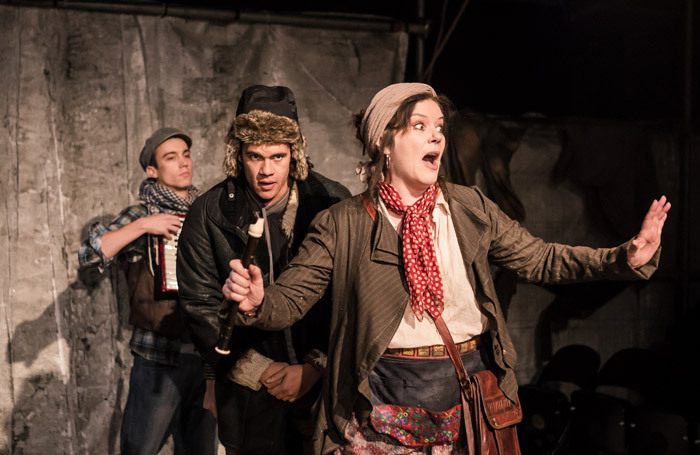 Mother Courage and Her Children is at Southwark Playhouse until December 9th. For more details, click here.